Dexter Daily: Julie Benz Ties the Knot! Julie Benz Ties the Knot! Via E!Online.com: Julie Benz is officially a married woman! Benz's rep confirms to E! 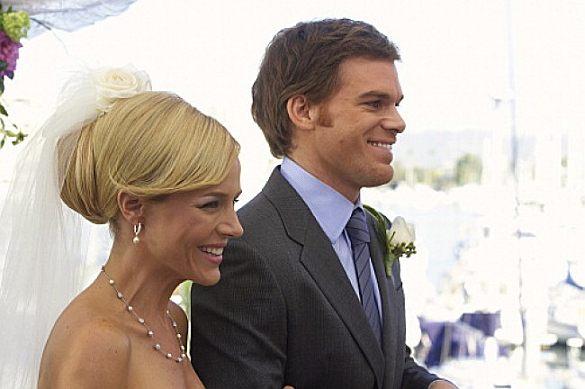 News that the former Dexter star walked down the aisle with her marketing exec boyfriend Rich Orosco on Saturday in front of family and friends. Orosco proposed to Benz in June 2011 with a whopping $80,000, 3-carat engagement ring and a surprise Mexican fiesta at her home with 60 of their closest friends and family. (It's the second time around for Benz, who was previously married to actor John Kassir from 1998-2007.) Benz and Orosco's Cinco de Mayo wedding date sure fits in with his Mexican-themed proposal. Damn, and it's not to Michael C. Hall? Ah would have been crazy anyways if Dexter ditched his sister for his dead wife going on two years.